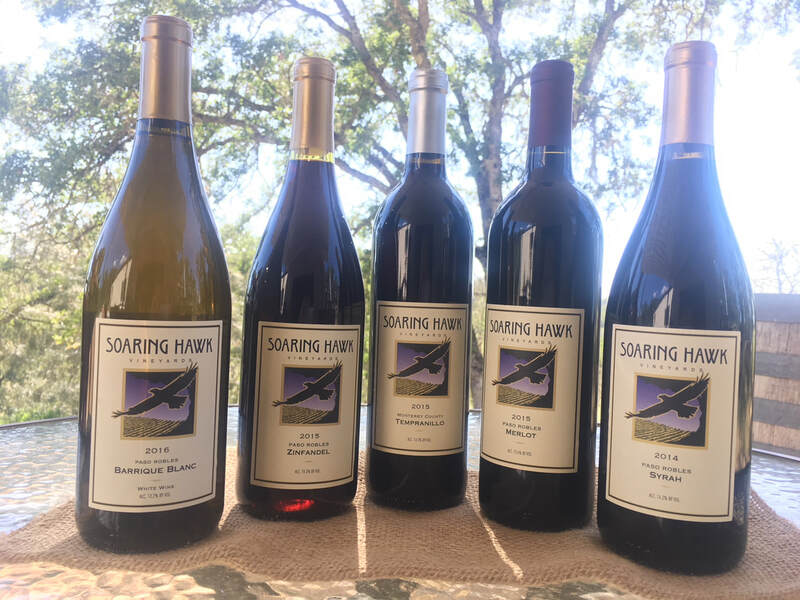 Four friends got together and started Soaring Hawk Vineyards – a 450-case production, casual and welcoming winery surrounded by oaks and wildlife on the beautiful back roads in Santa Margarita. We focus on wine education for everyone! We welcome the novice as well as seasoned wine tasters! Come enjoy a relaxing and fun experience with the owners and winemaker. Come ask as many questions of the winemaker as you'd like! We love to talk wine! We focus on Rhone varietals, but also make Zinfandel or other varietals that sound fun and interesting each harvest. Our boutique winery is about 8 miles southeast of the town of Santa Margarita in San Luis Obispo County. We are open by appointment and on weekends during some of the industry-wide festivals including Paso Robles Wine Festival (May 18-20, 2018) and Harvest Wine Festival (October 20-21, 2018.) Same day appointments are often available. Because we only produce about 450 cases annually, we have very limited distribution. You can find Soaring Hawk wines at a great little restaurant in Santa Margarita and occasionally at our favorite wine bar/shop in Templeton, but mostly here at our little boutique winery in Santa Margarita. One of the reasons we got into the wine business is because we LOVE wine and sharing with others so we really focus on getting a chance to meet our fans as guests to the winery. And of course our wines are available here online for those that can't get out here to the winery as often as they would like! Go to the "Contact Us" page for more location information.